Team Honours: A-League Premiership Winner (2012/13), Asian Champions League Winner (2014), Asian Champions League Dream Team (2013/14). Highlight: Scored his first ever goal for the Wanderers against Sydney FC in Round 26, Season 2012/13 on 23/03/2013. Highlight: Wrote the Wanderers team chant that is sung when the team wins a match. Highlight: Cole was the last player to have stayed with the Wanderers continuously from their 1st season. Description: A right sided wingback who is equally comfortable playing in attack or defence, his versatility and set piece quality earned him a perennial place in the match day squads for the Wanderers in his 5 year stint at the club. You're not planning on kidnapping him and putting him in your dungeon are you? Probably the most versatile player in the squad. I wasn't really certain about Cole until Saw him in a youth league match late last year. He really controlled the game in that NYL match and ever since I saw him then he looks better every game. He was very good for sure but Aaron & Jerrad surpassed him as MotM. Must say I feel more comfortable with Shannon there as Jerome's back-up this season contrasted to 2012/13. Tarek was more often in that role and whilst he had his moments he didn't have the versatility as Shannon. Last night SC was excellent in defence and came forward nicely. only online through the kindle..
Like J.R.R. Tolkien. Writers always seem more legit if they use their initials. Unless you have an awesome name like Elizabeth Barrett Browning, for instance. I've bought it, will give it a go when I finish the Peter V. Brett novel I'm tackling now. Will post my review here! Ahead of the NRMA Insurance Western Sydney Wanderersâ€™ action packed 2014/15 campaign we had a chat to our energetic defender Shannon Cole to hear about his exciting off season and thoughts on our upcoming campaign. An avid traveller who spent his off season in America and Brazil watching the World Cup Cole shared what it was like to take a break from the pitch and experience football from the stands, as well as his player of the tournament. The 29 year old also offered insight into the Wanderersâ€™ upcoming fixture in the FFA Cup against Adelaide City, and the new dynamic to the Wanderersâ€™ season as they compete in three very different competitions. While heading into the Hyundai A-Leagueâ€™s 10th season we grabbed Coleâ€™s thoughts on what the Wanderers have done for football in Australia and how far the league has come. Q: It is a pretty busy season with not a lot of down time, how much more important did that make the off-season for you? A: For me personally it is a great time to feel normal and free. I like to travel in the off-season because it is the only time when I get to travel somewhere and decide what I want to do that day and where I will go. Normally when we travel for football it is never a vacation it is always a job. In that sense for the off-season it is always nice to travel somewhere new, do it on my terms and just relax. Q: You went over to Brazil for the World Cup, as a player you wouldnâ€™t get to experience being a fan too often, what was that like? A: As a player Match Day is essentially another day at work. As a fan I got to the games really early, got to relax and just said well entertain me, show us what you can do! I got really involved in the matches â€¦ At the World Cup it was very different because the fans may only get to see their team play once and even when they were cheering they wanted to see every play, every pass, every touch and they wanted to abuse the opposition every second they could. It was very exciting! Q: There have been several standout performers at the tournament, tell us a bit about who your favourite has been to watch? A: The most impressive for me in person was Arjen Robben. He is just so fast and I feel like it is an unfair advantage to have that natural speed so that isnâ€™t necessarily what impressed me but he is the kind of player that gets so much attention. He is often marked by two or three players at a time but he is still the best player on the pitch in every game and that is amazing. That is why Messi and Ronaldo and these guys are the best because they get so much attention and are still the best players on the field. Q: Adelaide City won several NSL titles and are coached by a legend in Damien Mori, what sort of competition do you see them offering? A: They will be good because there are a lot of good players in all levels of football in Australia. I see that when I watch state league matches, there is so much talent in the lower leagues waiting to be noticed and there are a lot of players that feel they deserve a chance in the A-League. Those players will be taking the chance if they are given it and for them it is a massive opportunity and they will be hungrier with that knowledge. Q: The three competitions, the Westfield FFA Cup, the AFC Champions League and the Hyundai A-League are all very different, what are your thoughts on each of them? A: They are extremely different! With the Asian Champions League you play very big matches and big clubs which gives us huge exposure and showcases the Club to the world. While the A-League is a massive competition in itself, especially now as the rivalries are growing each year and the level of football is getting better with each round. Now with the FFA Cup there is a new dimension to football in Australia where people want romance stories of little clubs going a long way. That in theory now makes the bigger clubs like us the villains of the Cup. Theyâ€™re three big competitions that are all very different and it should be exciting for the fans. Q: It is the leagueâ€™s 10th season and Western Sydneyâ€™s third how has the league grown? A: I think the league changed when Brisbane Roar went through their unbeatable run with 36 games without a loss. 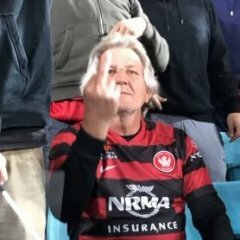 In that period of time they changed what was acceptable in the fans eyes, no longer was it okay to play â€˜ugly footballâ€™ and win at all costs [because Brisbane were winning with attractive football]. Also the level of coaching has improved dramatically over the 10 seasons. You can see that with Tony Popovic, Ange Postecoglou and Graham Arnoldâ€¦ Ultimately the coaches are responsible for the style and level of football here and fans have an expectation that beautiful will be included in every curriculum. Every team has an identity in their style but to please the fans and keep the league moving forward all of those identities have a basis of attractive football. Q: How do you think the Western Sydney Wanderers success has impacted the leagueâ€™s growth? A: The image of our club as a whole is something the rest of the league envies. Our stadium without doubt is the best stadium to come to and now because of our fans the spectators are trying to compete with one another. It isnâ€™t just about the football being competitive now it is also about the fans which has created good banter and helped to grow football. Haliti. But not by much. haliti for left back? right back? Especially for there versatility, willingness to play/live/die by the club, probably on not as much as they could be but willing to work/train/play hard at each opportunity they get! I didn't rate him in the first season, thought he was pretty ordinary imho....BUT! I've changed now n have become a huge fan! Thought he had an awesome game last , was my vote for 2nd best behind Covic. Brilliant at interviews , very articulate , n versatile for the team. Go Coley!!! He was our best player over the two legs. First game played in midfield & retained the ball so well & second game played in defence & did a great job on their biggest threats. Fantastic versatility, wonderful squad player. The thing I love about Cole, is that he was getting hammered down that side by Elkeson, and was clearly out of his depth. However Cole didnt give up, and on a few occasions got the better of his opponent especially in transition attacking. Cole has become one of my favorite players for this reason, he gives his all, and he is having the best years of his career..
Popa loves his utility players as they can play in various positions. Shannon's right hand which was strapped in the 2nd half was badly swollen when he arrived back last evening. I dare say he's been to get some scans today. Hopefully it's not too bad!!! are we still talking about football? when were we talking about football?